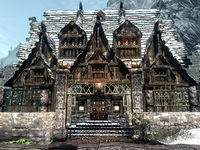 House of Clan Shatter-Shield is a large house on the western wall of Windhelm. Opposite Viola Giordano's House, next door to Hjerim which was formerly owned by their other daughter Friga Shatter-Shield. It is home to Torbjorn Shatter-Shield, his wife Tova Shatter-Shield and daughter Nilsine Shatter-Shield. All of whom are mourning the loss of their other daughter/sister Friga who died at the hand of a murderer, who you can find by completing Blood on the Ice. The yard in front and to the sides of the house contain nothing of interest. Upon entering through the master locked entrance you enter into a dining room with a long wooden table with benches either side in the center, doorways to the south and in the northeastern corner. Small units either side of the entrance, with the one on the left holding a pickaxe and two bottles of wine. The other on the right holds a bowl and three more bottles of wine--(see notes). To the right of the doorway to the south is another small unit holding another bowl. The table is laid with various high quality plates, jugs, bowls and goblets as well as two bottles of wine and a bottle of alto wine. To the right of the doorway in the northeastern corner are a couple of barrels with a set of shelves holding more bottles of wine and alto wine to the right of these. The doorway to the south leads into Tova Shatter-Shield's bedroom which consists of a single owned bed in an alcove to the east, with a knapsack by the head of the bed. Against the south wall is a set of shelves holding a flute and a bottle of wine, with a drum in front of it. Further along the wall are a stack of crates and sack containing foodstuffs. There is a wash basin against the west wall with a large round wooden table and a chair further to the right. On the table is a bottle of wine, a bowl and goblet. Against the north wall is a tall wardrobe containing fine clothes beside the doorway. Through the other doorway, to the north is a kitchen area with a flight of stairs up to the second story against the west wall, climbing to the south. On your right against the south wall as you enter this area are a series of small units holding a bowl, a jug and two bottles of Nord mead, with a small fire pit to the east with a cooking pot over it. Against the north wall is a larger fire pit with a non functioning cooking spit over it, with a narrow wooden table holding several food sacks to the left. Climbing the stairs bring you to a sitting room with a small unit holding two bottles of Nord mead against you the south wall in front of you at the top of the stairs. 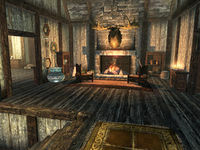 To the east is a large fireplace with a couple of low chairs pulled up in front of it and a small set of shelves in an alcove to the right holding a bottle of Nord mead. To the left of the fire place is a pile of firewood and by this, against the north wall is a set of shelves holding a goblet. There are two doorways from this room, one to the north and the other opposite to the south, they both lead to bedrooms. 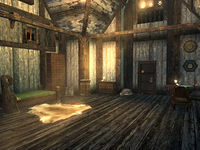 Nilsine Shatter-Shield's bedroom to the north contains a single bed along the north wall with a corner shelf holding a drum to the left and a tall wardrobe containing fine clothes to the right. In front of this is a wash basin, with a small wardrobe to the east and further to the right in an alcove is a set of shelves holding an Unusual Gem and a bottle of Nord mead. 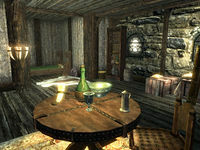 In the southeast corner of the room is a large round wooden table and chair, with a plate, goblet and bottle of Nord mead on the table. Against the west wall is a low chair, a couple of barrels, several sacks and a crate beside another set of shelves. These hold another bottle of Nord mead. The other bedroom, to the south is used by Torbjorn Shatter-Shield and contains a single bed coming out from the east wall with a small unit to the right, with a steel sword on the floor in front of it. Against the south wall is a tall wardrobe, a wash basin, a long unlocked chest and in the southwest corner a large round wooden table and chair, with a plate on the table. Against the west wall are a stack of crates and to the right a set of shelves holding a sack of food, with a lute leaning against it. In the northwest corner is another sack and barrel. In the northeast corner is another corner shelf, with a small wardrobe to the left and a set of shelves further left, by the doorway these hold a woodcutter's axe. After completing a Dark Brotherhood quest, if you decide to include Nilsine Shatter-Shield, when you next enter the home you will find Torbjorn Shatter-Shield sleeping in the northern bedroom and Tova Shatter-Shield laying dead on the floor beside the bed with a note lying next to her body explaining her depression and wish to be reunited with both her daughters. There is a Loot shadowmark to the top right of the entrance door. There is a rather unique collection of under-sized and over-sized wine bottles in this house. However, once they are taken they stack normally in your equipment list and if dropped they will be of normal size. There is an Unusual Gem on the second floor in the northern bedroom on a set of shelves against the eastern wall. The right corner of the house's exterior is not solid, allowing you to bypass the town walls. This page was last modified on 13 October 2018, at 13:21.